Its always nice to see TRIP being quoted in the peer-reviewed literature. This recent systematic review (click here) used TRIP as one of the search resources. The company’s first effort under the new initiative is to buy software developed by physicians and other researchers from Washington Hospital Center, a not-for-profit hospital, according to the Times. Gates Inc. will also hire two of the three doctors who created the software system, as well as 40 members of the development group, the Times reports. The software, called “Azyxxi,” is used to cull and rapidly display medical information on patients from a handful of sources, including EKG records, X-rays and MRI scans, according to the Times. Answering Physicians’ Clinical Questions: Obstacles and Potential Solutions. Another paper on Q&A from the Ely, Osheroff (et al) stable. I’m still puzzling over the concept of an answer…. It would appear from the above paper that an answer is judged by the doctors. I suppose the issue being, does it help remove their uncertainty. However, the removal of uncertainty has little relevance to a ‘correct’ answer. So a doctor might be uncertain which drug to give A or B to a patient with condition X. The doctor finds the first paper on Medline which suggests drug A is better. So they decide to use drug A. However, 5 papers down is a systematic review that shows B is superior to A. So the doctors uncertainty has been plugged by seeing a paper supporting drug A. However, the ‘correct’ response (from an EBM perspective) would be to use drug B. Ironically, for the patient in front of the doctor drug A might actually work better – but that’s another story! Thanks to Dean for highlighting this story. 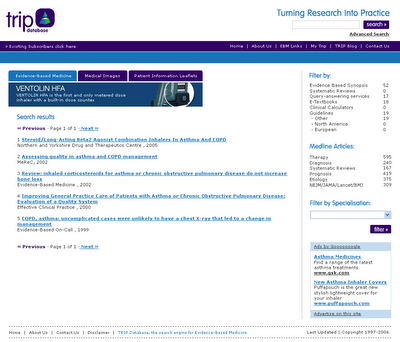 The first look at the new search results page, not quite there but nearly! The tabs for nvigating between EBM, Medical Images and Patient Information needs alterating. Also, as the Big Five journals (JAMA, NEJM, Lancet, BMJ and Annals of Internal Medicine) are being integrated into the main search that category will be removed. “Evidence Matters (EM) is an award-winning, venture-backed company which has created a novel knowledge management system for the medical field. ” or so the blurb says. As the subscription market gets more crowded by groups who hope to squeeze money out of health organisations I can only rejoice at our decision to move away from that particular business model. Evidence Matters has had some significant investment around $1.5 million (Canadian dollars I assume). One of the most poignant comments for me, regarding the move to free-access for TRIP, came from Brian Alper (who heads up another subscription ‘knowledge’ thingy). He basically said that people are not expecting to pay for search. I tend to agree with Brian. However, who will be right – us or the venture capitalists? This has a beta natural language processign feature which I’ve been trying out. Often, when answering clinical questions I look for background on Google. Answers.com might be a useful place to look. I have a slight concern about bias creeping in as it’s not clear how they create their answer. For instance they (answers.com) may say that drug X is useful which might then cloud my judgement. The fact that answers.com may have obtained their answer from the pharma company responsible for the drug is initially hidden. Transparency seems to be the key. We frequently receive requests for free access for conferences/workshops – we’re always happy to oblige. It looks like we’ve received our last request before going ‘free’. The Evidence-Based Health Care Workshop in Colorado has asked for free access. Bad timing as they want access from 31st July to 30th August. People attending the conference will get acquainted with the subscription version. Then, the next day (31st August) TRIP will move to free-access as well as having an overhaul of how the search system works! We’re currently waiting to receive the beta-version of the ‘new’ free TRIP – should be within the next week. Assuming there is nothing too badly wrong with it we’ll go free as of 31st August. Why the 31st? Our web c0mpany doesn’t like launching new sites on a Friday (which is the 1st September). Therefore, the free version will go live in the evening (UK time) on the 31st August – the Thursday!